My application for Non-Hosted Google AdSense was approved in 15 days. 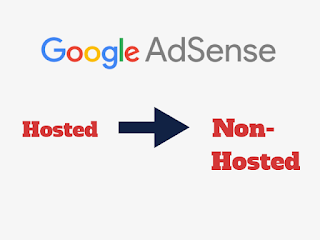 Though I run my Blog on Blogger host and it offers to get Hosted Google AdSense easily for making revenues, I had chosen to get non-Hosted Google AdSense. Because there has the major difference between them. Don't buy Google AdSense account from others. It is just about loosing your money and self-confidence. If you want to earn money from INTERNET, then try it in hard-way and legally, otherwise you will give up attempting to earn money from here. Do you want to get approval fast? Then choose Hosted AdSense. What type is your Domain? If custom Domain then choose Non-Hosted. Do you want to show ads for multiple Domain or services? Then choose Non-Hosted. Both type AdSense has advantages and disadvantages too. 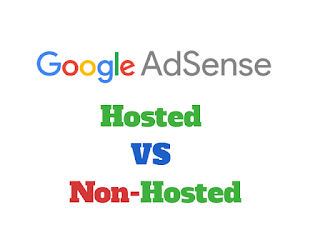 Your confusion will be removed to see the differences between Google AdSense Hosted and Non-Hosted. Easy to approve. Quite difficult to approve. You are not allowed to show ads other domain, whether that domain registered with yourself or not. You can add any custom domain (.com, .net, .info etc) which are registered with yourself and complies the ads policy to your current Adsense account to show ads in the different domain. You are allowed to use this type account on which is Hosted by Google. You are free to use this type account on Hosted and non-Hosted both. You can't earn from AdMob and other services with the Hosted account. You can earn from Youtube, AdMob, Windows app alongside your current service. "If you want to use your Hosted account to show ads on your own website, you have to upgrade your account. You are free about this. Marked with "Hosted Account" at the top left corner in Google Adsense account. Not marked. * But keep in mind, your net revenue from AdSense is 68% for content and 51% for search. Because Google cuts 32% for content and 49% for search as ads earnings. Example: If advertiser pays Google through Adword $1 per click on providing advertisement, you will earn $ 0.68 as publisher. 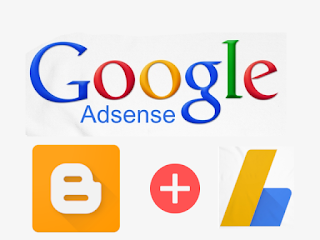 Before applying any type Google AdSense account you must follow the instructions seriously. Otherwise, you will be hopeless when you will see your application is not approved. Own Site: You must have a website that is owned by you and verified by Google. You can verify your website from Google Search Console with Meta tag easily. Complies with Program Policies: Content of your website must comply with AdSense Program Policies. Active Site at least 6 months: It is not the major requirement for all region. It is especially required for India, Bangladesh, Pakistan. At least 18 years: Your age must be at least 18 years old. If you are younger than, you can create AdSense account with your Mother and Father as an account holder, Payee Name with full information. 1. Original and Relevant Content: Keep writing original and relevant content to post. Strictly follow copyright policy. Try to keep at least 500 words each post. It is better to keep more than 1000 words per post to crawl effectively. Because Google crawl loves rich content. 2. Provide a Comment Section: Putting comment system makes good communication with feedback. 3. Easy-to-use navigation: Check your navigation bar works correctly. Example: Proper alignment, Easy to read, Drop-down menu works perfectly etc. 4. Interesting and Unique Contents: Interesting and unique content will gather organic traffic and increase page views. 6. Page Speed: It is better to increase page speed by reducing the suggestions from Google Speed Test. 7. Content-Language and Crammer: Google AdSense allows only supported languages by it. And avoid grammatical errors. To get Non-Hosted AdSense as a publisher you need a website with a custom domain that is owned by you. Check eligibility before applying AdSense. 8 steps to apply Google AdSense for Website. Put URL of your website and Choose Language. Save and Continue. Contact Information: Choose your country, Time Zone, Account Type, Name and Address properly. It is the address for you to contact. How did you get to know AdSense? Provide your answer from the drop-down menu. Check all from AdSense Email preferences. To accept AdSense Terms and Condition (Please read carefully) Check box and Accept. You will get some script code for your website. Copy this code and put just after <head> tag without any modification but you can onlysync = 'sync'. It is needed for Blogger platform. Otherwise, the template won't be saved. Finally, save your HTML file. Then check on the box and Done. It will take 3 business day to review. After reviewing you will get the email notification if your application is approved or not approved. I hope your application will be approved. Question: I have a Google AdSense account on Youtube. Can I use Youtube AdSense account to show ads on my website? 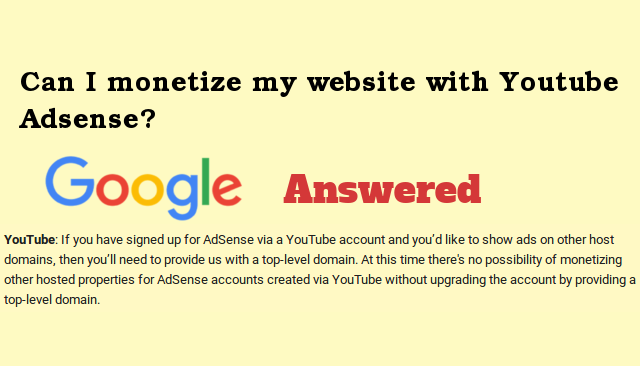 Can I monetize my website with Youtube AdSense? So you are not allowed to monetize your website without upgrading your Youtube AdSense account. You have an AdSense account on Youtube. For monetizing you created this account Via Youtube. 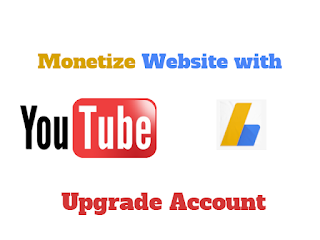 Now if you want to monetize a website or blog, then you can do this with the same AdSense account. But you have to upgrade your Youtube AdSense account. To upgrade the first condition is about TLD (Top Level Domain. Example: .com, .net, .info etc). If you run your Blog or Website through free domain like Blogspot, Hubspot etc. then you have to add custom domain. And for that, you have to purchase a domain. Then upgrade your AdSense account. Click on Upgrade now. Then complete the application form correctly. To show ads implement AdSense code on your Blog. If your application is approved then you can place AdSense code on any website which owned by you without further approval. It does not matter that you create AdSense account via Youtube or Blogger. Since both of them are Hosted by Google, you have to provide Top Level Domain to upgrade into Non-Hosted account. If you want to blog in Blogger platform, then justify the domain provider that if they provide the custom domain for Blogger or not. For better, you can purchase the domain from Godaddy. 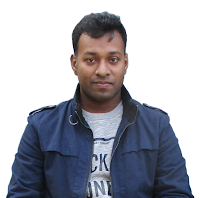 It offers custom domain for Blogger with supports. 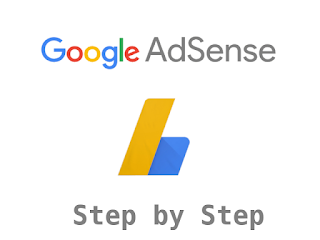 To convert your Hosted AdSense account into Non-Hosted follow the instructions step-by-step. 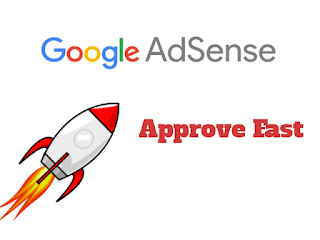 After reviewing your website, the Google AdSense Team will send you an email about approval. If your application is approved then you can place AdSense code on any websites or blogs are owned by you. To approve AdSense with Blogger, you can select Hosted or Non-Hosted account. If you want to Non-Hosted (Why Non-Hosted, we have discussed earlier) then the process is same as Apply for AdSense for the website: Get non-Hosted Account. Read: How to get approval AdSense for Blogger fast. and your blog complies with Blogger Content Policy. Blogger AdSense Approval Tricks: If your Blogger blog has been qualified to approve Google AdSense then it is the most effective approval trick. And to qualify and to get Google AdSense approval fast, follow this below. Connect your blog to Google Search Console. Keep at least 50 posts and try to keep unique, original and relevant content. Don't include prohibited content. Follow the Blogger Content Policy strictly. Don't change the design of Blog within AdSense approval processing. Keep About, Contact, TOS pages. Remove other ads if have. Apply from Blogger → Earnings. To apply AdSense with Blogger follow the instructions step-by-step. Next, Follow the instructions from step 3. I hope this article has helped you to receive the basic and FAQ with the answer about Google AdSense. Let me know through a comment that what is your present situation about processing AdSense. On the way of approving or approved? Share with us. If you have any problem, you can share with me privately or publicly. Don't feel hesitate to share with me. can I apply for Adsense if I host a custom domain in Blogspot? Good artucles. I like your sharing. you are awesome. just find your site today.I maied you cheak it. Google AdWords promoting generally begins off as an experimentation for advertisers who are new to utilizing AdWords.